Looking for an easy way to make your home stand out from the rest of the houses on your block? Ornamental fencing can add real and aesthetic value to your home property with professional design and installation. Ornamental fencing is typically made from wrought iron or similar materials and can hike up your curb appeal as it provides your home with great security as well. Iron ornamental fencing is sturdy and can be made with beautiful ornate designs, but high quality aluminum and steel ornamental fences are available as well if you want the look without the price tag. Ornamental fencing can add real and aesthetic value to your home property with professional design and installation. How Does Ornamental Fencing Add Value to My Home? Although a fence won’t keep all trespassers out, it can serve as a great deterrent. Basic and inexpensive chain link or wooden fencing adds security as well, but they don’t come with the curb appeal that ornamental fencing does. Iron ornamental fencing is incredibly durable and will hold up to just about anything you throw at it. Ornamental fencing can quite literally add monetary value to your home as well. If you choose to sell your home, a home with a decorative iron, steel, or aluminum fence will actually raise your home’s appraised value. Ornamental fencing can add beauty and aesthetic appeal to any property. You’d be surprised at how much better your home looks with some fancy decorative fencing out front. You will need to select an ornamental fence depending on your budget and the style of your home. Consider which design will add the most curb appeal and overall value to your home. If you have an older and more ornate home, a decorative pattern might suit you the best. However, if you have a more modern home, a basic and simple fence design will probably fit in better. 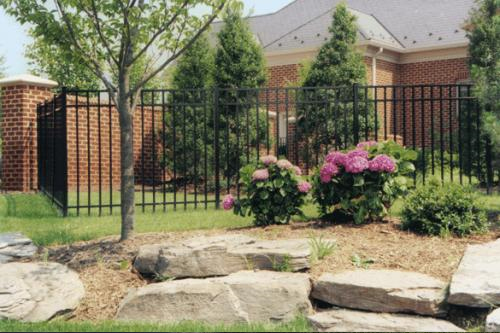 Hercules Fence of Richmond, VA prides itself in installing fences at some of the most prestigious places in the world, as well as for many government agencies & and well known businesses. We are proud of our unique and prestigious fence installations that we like to recognize as our ”Signature“ projects. Whether a custom installation designed by a Hercules professional, or a challenging project at a national landmark, Hercules fence takes a special pride in these jobs. This entry was posted on Tuesday, September 29th, 2015 at 7:00 pm. Both comments and pings are currently closed.